The four participants on this album all hail from Omaha, Nebraska. Not a town that springs readily to mind in the history of jazz. Although, as drummer Dana Murray, recalls: "In the ballroom days everyone came throughCount Basie, Duke Ellington, Louis Armstrong, Dinah Washingtonthe list goes on." But it is the friendship and familiarity of Omaha's local scene that shines through here. Saxophonist Jorge Nila, the leader, who went to the same school as Murray, made full use of these qualities to form a quartet that would pay tribute to some of his idols. On guitar there's his friend Dave Stryker, ex-Jack McDuff and Stanley Turrentine, and with whom he has played a great deal over the years. And on keyboards Mitch Towne, with a reputation as the "go-to" organist of the Midwest. When it comes to tenors, Nila says he sees Lester Young as "like a great apple tree with every other saxophonist being the fruit that grew from his roots." He continues: "We didn't have time to pay homage to everyone but the guys I have seen and been listening to for years are all here." First up: Dexter Gordon and his composition "Fried Bananas" from 1972, originally recorded with a Dutch rhythm section as Long Tall Dex's stay in Europe came to a close. Nila's treatment is less pushy than that of Gordon, a supreme egotist who never cared that much about giving other players a look-in. For Gordon the important thing was always Dexter. Hank Mobley's "Soul Station," from a later, more relaxed era, sees Stryker getting a good share of the action with an excellent solo and Towne sounding like he was on board the Jazzmobile in those good old days before someone told George Benson he could sing. Nila comes into his own on the Tadd Dameron ballad "On A Misty Night" with some fine blowing before Stryker takes over, followed once more by Towne. There are two interesting inclusions. One is "Our Miss Brooks" by Harold Vick, a great but largely unrecognized hard bopper. Two: "The Eternal Triangle" by Sonny Stitt, who you don't hear such a lot about nowadays. Proof that even Charlie Parker could get things wrong, after famouslybut no doubt apocryphallyannouncing on his death bed that he was giving Stitt "the keys to the kingdom." Track Listing: Fried Bananas; Soul Station; On A Misty Night; Infant Eyes; Rocket Love; Inner Urge; The Everywhere Calypso; The Eternal Triangle; Our Miss Brooks. 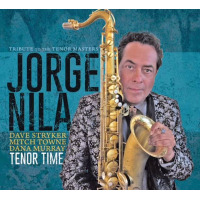 Personnel: Jorge Nila: tenor saxophone; Dave Stryker: guitar; Mitch Towne: organ; Dana Murray: drums.